Heat a small skillet and roast the coriander seeds, fenugreek seeds, cloves, allspice, peppercorns, and cardamom until the coriander seeds are a couple of shades darker. Add the chiles and the onion flakes and grind into a coarse powder in a blender or spice grinder. Remove to a bowl and mix with the paprika, cinnamon, salt, nutmeg and ginger. In a bowl mix 2 tbsp of the vegetable stock, berbere spice, lemon juice, paprika , mustard and salt. Set aside. Heat olive oil in a saucepan. Add the onions, herbs and garlic along with some salt and pepper. Saute, stirring frequently, over medium heat until the onions are translucent and just beginning to turn color. Add the lentils and stir well. 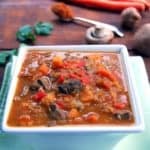 Add the tomatoes, mushrooms, sweet potatoes, carrots, and bell peppers along with the berbere spice mixture dissolved in the vegetable stock. Stir well to mix, add 5 cups of vegetable stock, and bring to a boil. Cover with a lid and let the sauce simmer on medium-low heat about 30 minutes or until the lentils are cooked and soft. If the mixture gets too dry, add more water or stock. Add salt and more ground black pepper if needed. Turn off the heat and garnish, if desired, with fresh coriander leaves. Serve hot with rice or bread.